According to independent developer TeknoGames, Sim War 5 is a war simulator. Shocking, I know. But what you may not know is Sim War 5 features some fierce two player co-op action in a pixelated world in an epic battle for survival. 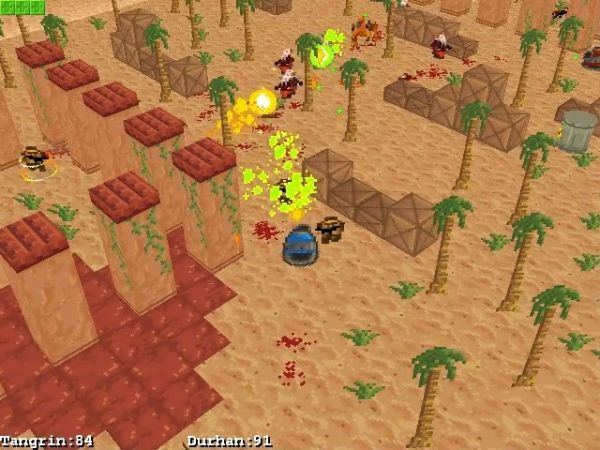 The game's numerous levels play out a bit like a team based shooter, where players are constantly working together to take control of the map. There's weapons, powerups, and plenty of explosions along the way with plenty of maps to keep you busy. The game is local only, but two players can both use a keyboard - or as we recommend - a dual analog gamepad. The style and pixelated blood and gore definitely add to this title. After spending all of your money on a nice coffee mug for Grandma this holiday, it may be the only game you can afford. Thanks to the PixelProspector for the tip! Page created in 1.1815 seconds.